One of the best things about owning a Silhouette is all of the cool gifts that I can make with it! I always get, “You made this?! 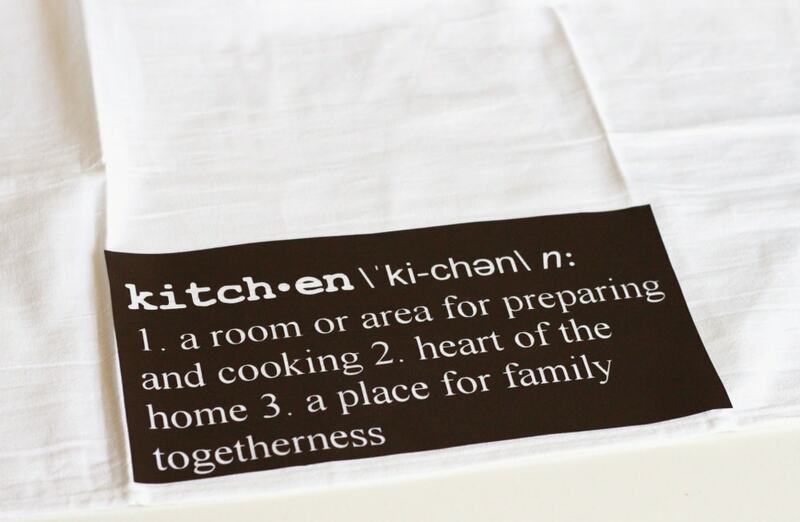 How did you make this?” I made these cute definition art tea towels as teacher appreciation gifts for Evan’s kindergarten teachers. They loved them! 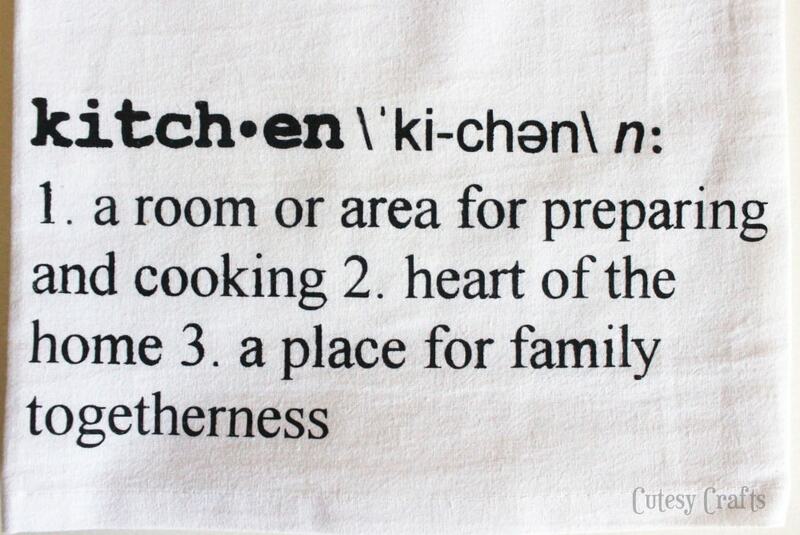 So fun for any kitchen decor! 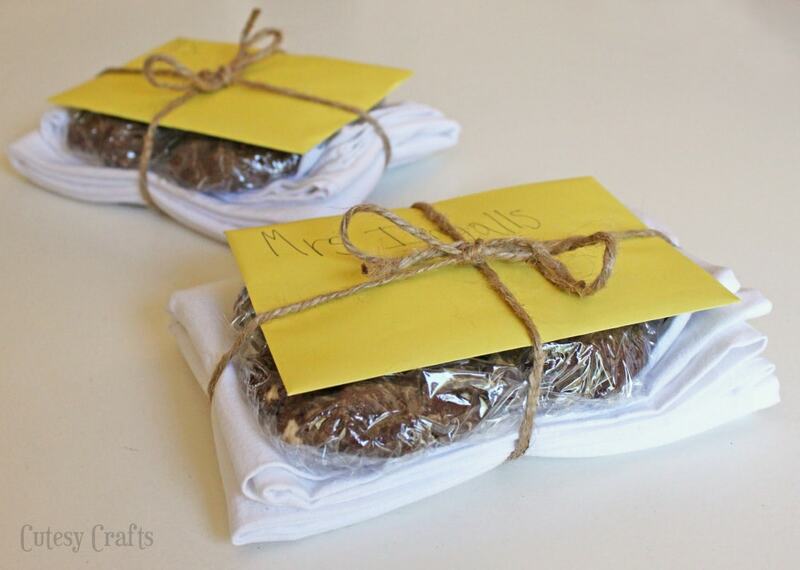 Wrap the tea towels up with some cookies and a note, and you’ve got yourself a simple homemade gift! If you have been waiting to buy a Silhouette, now is the time! What makes the Silhouette so special is that you can cut any shape that you can dream up, and the Designer Edition of the software makes creating your own custom shapes SO much easier. You will eventually want the designer edition, so best to get it while it’s on sale! To get these great deals, click the special link HERE to take you to the promotion page and enter code CUTESY at checkout. 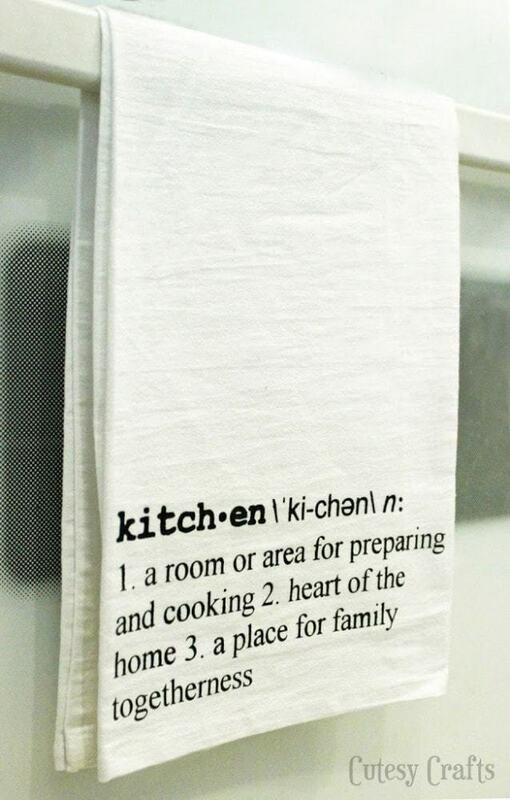 These tea towels were so easy to make! All you need is a flour sack tea towel, some vinyl, and some fabric paint. I got the tea towels at the craft store in the embroidery section. 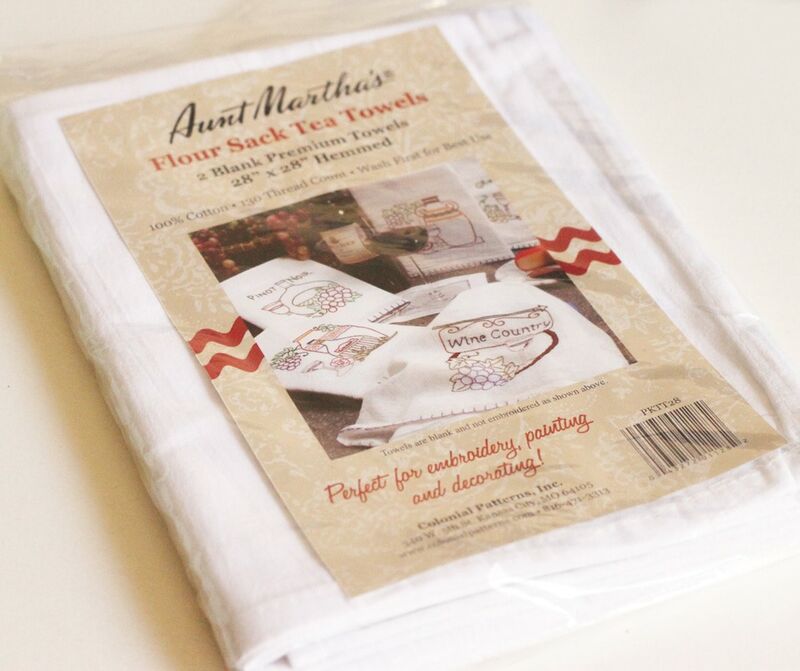 They are the same kind I used to make Audrey’s flour sack towel skirt. Wash and iron them first. I made the cut file using the Silhouette Studio Designer Edition. The fonts I used were Type Wrong, Arial, and Times New Roman. 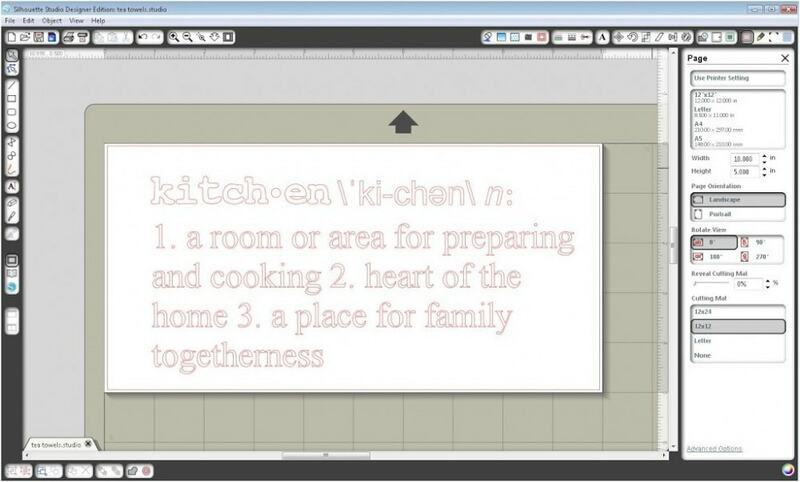 I used the circle tool to make the circle after the “kitch” in kitch-en. Easy peasy! You can even download the free cut file here if you want. 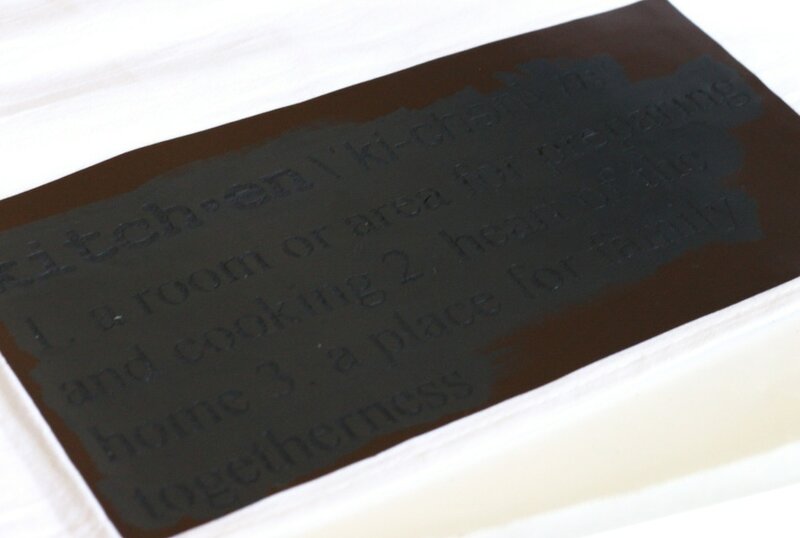 Cut your vinyl, peel out the letters, and transfer your stencil onto the bottom, middle of your tea towel. Take some black matte fabric paint and paint over the stencil. Just be careful not to shove the paint under the vinyl. Silhouette also makes a fabric ink that I am dying to try! Wait for the paint to dry and then peel off your stencil. Voila! Now just heat set the paint and you are done. Follow the instructions on your paint. 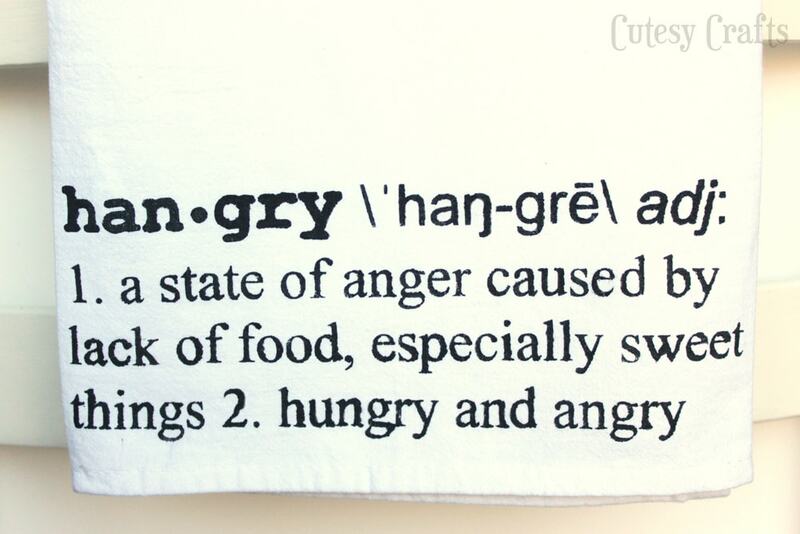 This usually involves ironing or throwing it in the dryer. Go check out my other Silhouette craft tutorials to see what else you can make with this awesome machine! 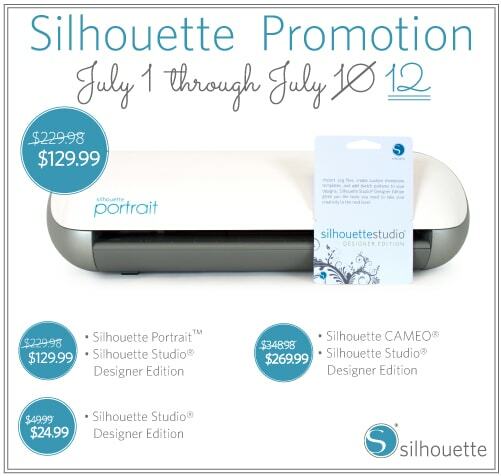 Cutesy Crafts is an affiliate of Silhouette America and will receive a commission if my promo code is used. As part of Silhouette’s promotion, I was given a free product to use. All opinions are my own. To read my full disclosures click here. These tea towels are the best. Thank you so much for sharing your cut file! I love this! 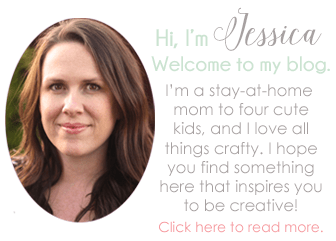 I’ve pinned it and can’t wait to try it! What a great idea for a teacher gift! Pinning! What a great idea….on my gotta do list! So I am pinning it right now! That’s a great teacher gift idea. Sadly, I don’t have a silhouette machine. 8-( I’m visiting from the On Display Monday link party (Snippets of Inspiration). Thanks, Christy! I love my Cameo! That is the cutest idea ever! I Love it!! Thanks so much for sharing with us at Thursday’s Temptation! I am going to be featuring your towel at tonights link party! Very cute, and so much better than just buying something off the rack. Thanks for cut file.I used it. You’re welcome! Glad you were able to use it! Great idea and thank you for the file! Can the stencil be reused more than once? Thanks! Unfortunately it can’t. If you want to make the project cheaper, you can try using contact paper from the dollar store instead of vinyl. I’ve used it successfully for stencils. It’s just a little harder to see when weeding.